These are the numbers of active tweeps in the Middle East region according to a study from Dubai school of government’s Arabic Social Media report about the active twitter users in the Arab world in March 2012. Amazingly Egypt comes fourth in place “215,000 tweep” after Turkey “1.07 tweep” , Saudi Arabia “393,000 tweep” and Kuwait “235,000 tweep” !!! 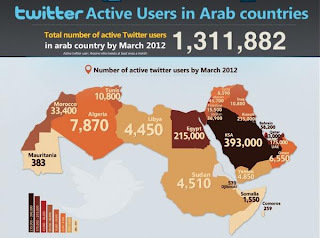 Of course if we consider the Arab world the top countries based on the number of active tweeps are : KSA, Kuwait , Egypt and UAE. Thanks to Rami Mohsen for the heads up. this represents the number of tweeps who tweeted in the last few days "geo-tagged" tweets, in egypt people are a lot more tech savvy than in saudi arabia where most people don't know or care to turn the geo-tagging off. also since most of these projects rely on Twitter public timeline (which only goes 3 days back), it doesn't even measure geo-tagged tweets accurately. Also there is the factor of fake followers which is a lot more popular in saudi arabia since more people can afford them. it's old info, many now on twitter!